This is an important article for anyone who has student loan debt. The more your debt, and lower your imcome, the more important the article. Bottom line is that everyone who feels burdened by their student loans should read this article, and its links, and figure out if this new plan is something for them. If it is, take action. Problem is, how to figure all this stuff out? It may be so important, and complicated, that some people might want/need professional advice. That’s actually something I’ve long been interested in, but it’s been low on the priority list compared with my other projects. I would love to hear from any of you with the relevant knowledge, experience, and drive to setup a web- and phone-based business providing student loan consulting (in partnership with me). I’ve already got a good domain name: StudentLoanConsulting.com. I guess I could always sell or license that name as well. If you’re interested in any of this, just contact me. For the first time in years, there is good news for college students who borrow to pay for their education. Starting Wednesday, the federal Education Department will begin offering a repayment plan that lets graduates reduce their loan payments, based on their income. Also on Wednesday, the interest rate on new federal Stafford loans, the most widely used federally guaranteed student loan, will drop to 5.6 percent, from 6 percent. By 2012, the rate will fall to 3.4 percent, under a schedule mandated by Congress. The changes come as student borrowers face a difficult job environment and after many families have found it harder or impossible to use home equity loans to pay for college. 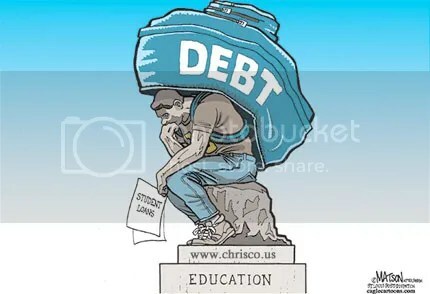 Since the credit crisis, it has also become more difficult and more costly to obtain private student loans, which are not guaranteed by the government and which typically carry variable interest rates determined by borrowers’ credit histories. “These benefits are guaranteed, no matter what happens in our economy, and are kicking in at exactly the right time for millions of Americans,” said Representative George Miller, Democrat of California and chairman of the House education committee. While the interest rate cut applies to new loans, the new repayment option is available to borrowers who took out federal loans or who used a federal consolidation loan to combine their higher-education debts. To help borrowers understand the program, the Education Department has set up a Web site with a calculator to determine monthly payments based on income and family size. The extended payment plan is intended to work with another program that forgives federal loans taken out by people working in public interest jobs. If borrowers make payments under the income-based plan, the balance on their loans is forgiven after 10 years. There is a catch, though. To participate in the program, borrowers must shift their loans into the federal Direct Loan program, in which the government extends credit directly. The forgiveness is not available for loans made by banks or other loan companies, like Citigroup or Sallie Mae. The definition (PDF) of public service under the forgiveness program is broad. Jobs in government, public schools or colleges, nonprofit organizations, public interest law, early childhood education, public health or public libraries all could qualify, according to the Education Department. The forgiveness benefit could lead to even greater interest in public service jobs, which are already drawing more applicants. For example, in the 2008-9 academic year, more people than ever applied to Teach for America — 40 percent more than the year before, said Kerci Marcello Stroud, a spokeswoman. The earliest anyone working in public service could see any benefit from the forgiveness program is 2017, because the program began in 2007. So someone who started teaching in 2005, for example, would not get credit toward the 10-year period for working in 2005 and 2006. Due to the length of the program, people interested in participating will have to be careful to document their public interest employment and to make sure they have the right kind of loans. Neither of the new programs help with repayment of private loans made by banks or other lenders. An article on Tuesday about a new student loan repayment plan by the Education Department that lets graduates reduce their loan payments based on their income misstated the current interest rate on federal subsidized Stafford loans. It is 6 percent — not 6.8 percent, the rate for unsubsidized loans. Subscribe to this blog via RSS or email. Check out the latest BuzPal t-shirts here! Gather your loan information, showing balances, type of loans and lenders. Then contact your lenders. If your lender will not offer income-based repayment, call the Education Department at 1-800-4-FED-AID and look into consolidating your qualifying loans into the Direct Loan program, which is administered by the federal government.